An almost finished Cedar Waxwing! 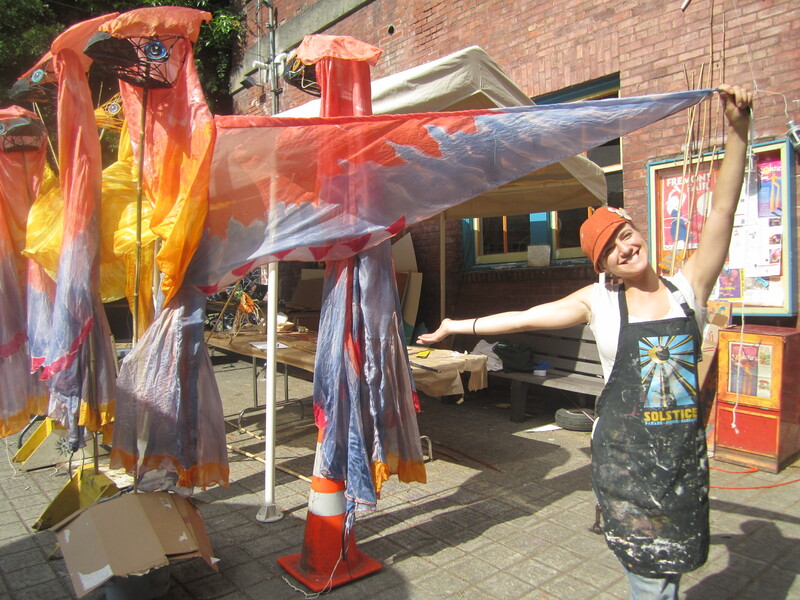 The Giant Flying Cedar Waxwings for Giant Puppets Save the World are past the design stage and are presently being constructed by workshop participants and project directors Toni Mikulka and Sarah Lovett. The birds’ heads will be made out of reed with hand-dyed silk wings spanning 15′, connected to a windsock beneath to create the form for the body, which will be held up by three bamboo poles tied to piece of piping running the width of the bird’s wings. Here the Cedar Waxwing represents a strong appreciation for our local ornithology of the Pacific Northwest and is a symbolic representation of letting go and taking flight with your whimsical creative inspirations, collaborating, and knowing that together, as a flock we can overcome anything. Inspiration for the Cedar Waxwings stem from Toni Mikulka’s apprenticeship with Bread and Puppet in the summer of 2010. She found immense joy in the giant flying white birds that rounded the puppetry performance meadow and field. Images of the white flying bird and simple design are from the Bread and Puppet Theater, based in Glover, Vermont. Sarah Lovett found inspiration in creating the Cedar Waxwings because the bird species is often seen enjoying berries on trees that are long over ripened and left on trees during winter months. Once, upon seeing the birds in the trees, she found them dead beneath the tree because they had eaten berries covered in pesticides and poison.